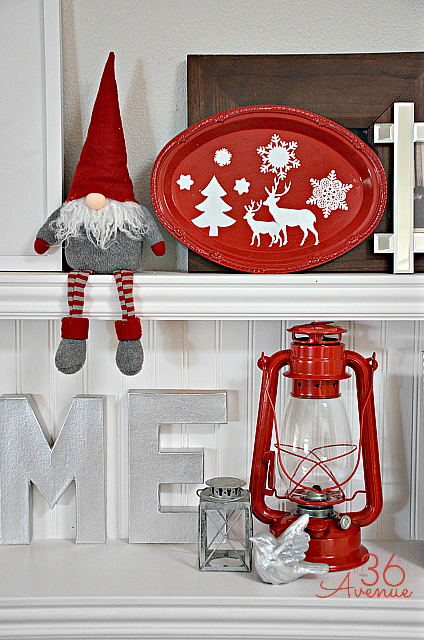 I’ve been wanting to show you this DIY Christmas Decoration Idea… A few weeks ago I received in the mail a wonderful package full of Martha Stewart Crafts and it was instant love. 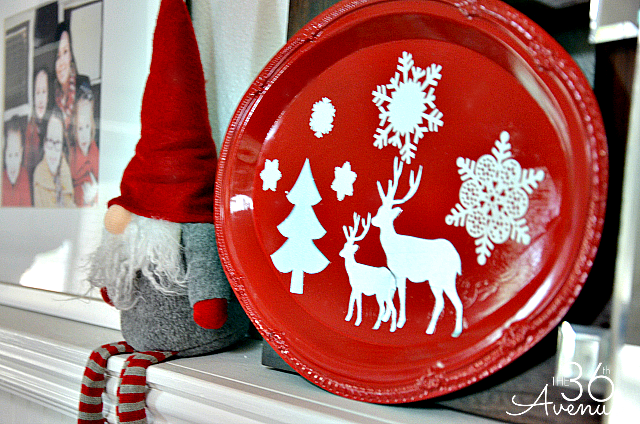 The pretty stencils and the gorgeous Christmas colors inspired me to create these Decoupage Platters. 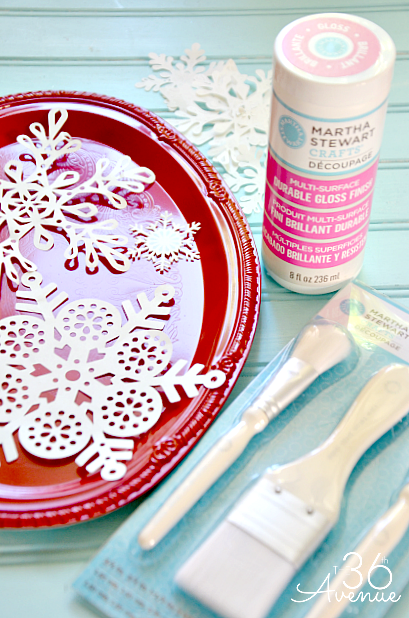 You can find the Martha Stewart Crafts line in-store at Michaels or in Plaid’s online store. Also you’ll need a surface to work on. You can find these metal platters at your local Dollar Store. The first thing you want to do is prepare your surface. 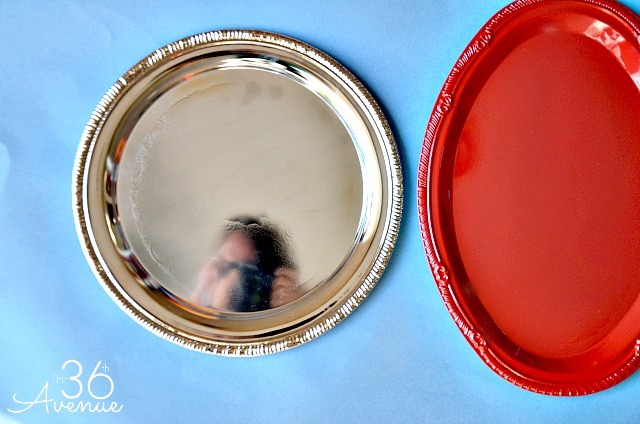 I spray painted my metal platters in a glossy red and white color. Let them dry completely before you proceed. Choose the decoupage papers you would like to use for your design. 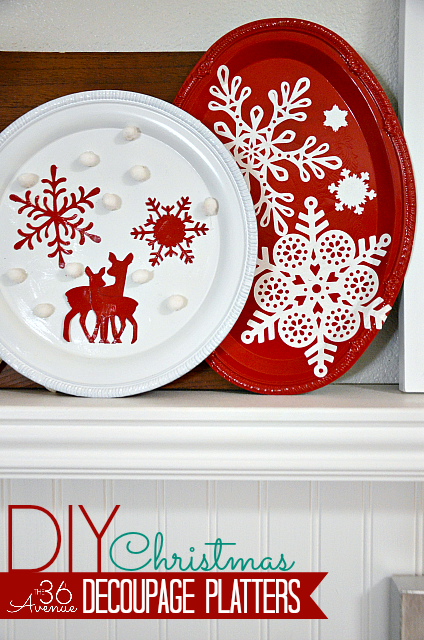 Martha Stewart Craft Christmas Stencils. I just popped them out and spray painted them. I like to place the items on top of my surface to have an idea of how I want the final project to look. 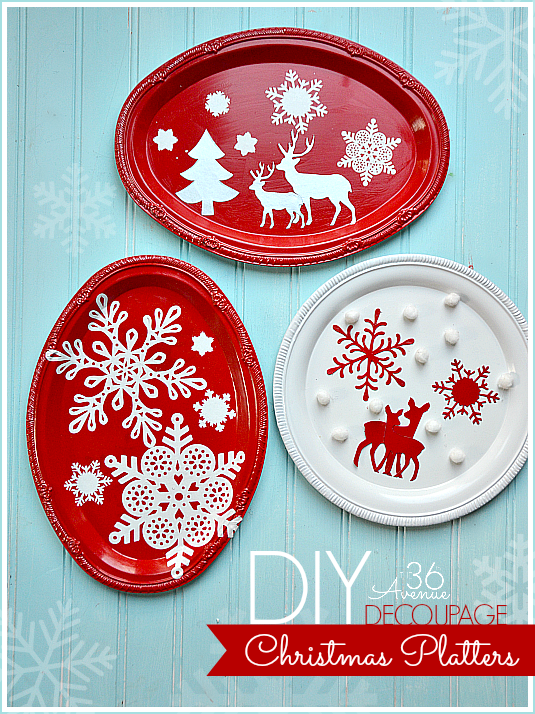 It is time to have some fun and decoupage. and also to the back of the papers you are going to use. This first coat will act like glue. 2. While wet place your Decoupage Papers on top of the surface, creating your design. 3. Brush the Decoupage Solution one more time over the entire design and let it dry. The drying time will depend on the decoupage you use so make sure to read the instructions on the back of the bottle. This decoupage is dishwasher safe my dear! 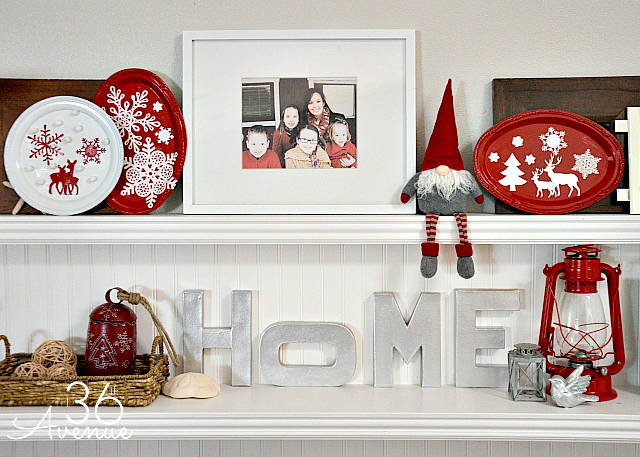 After they are dry you are ready to display them in your home! 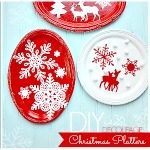 You can also hot glue ribbon to the back of the platters and hang them instead. 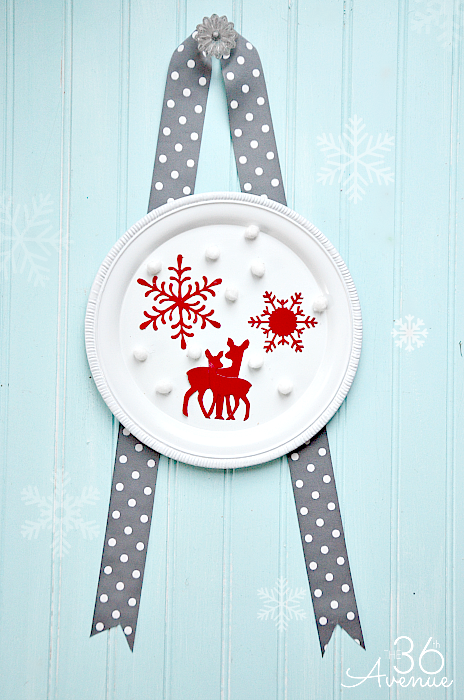 I glued some pom poms to one of my platters to make it look like snow. and also follow along on Facebook. You can also sign up here for their Email Newsletter. Thank you for visiting with me today friends! Hi Denise and welcome to The 36th Avenue! Can you use the platters for food? Maybe not wet food, but some dry foods? Just curious. I love these! I am using these for decoration only. 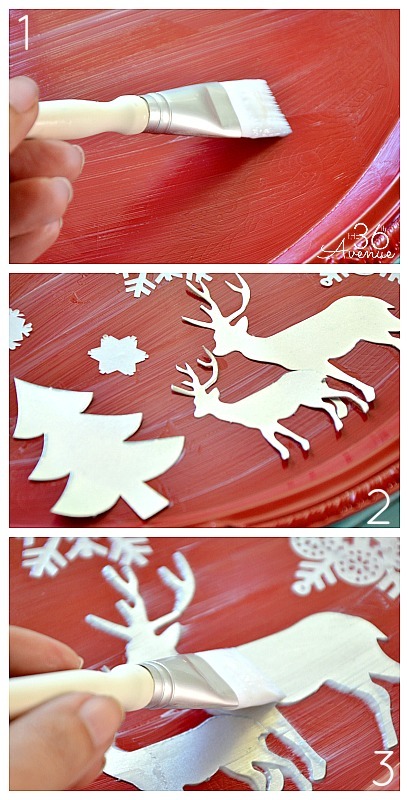 So cute and so easy! I love them!! Absolutely love the platters! What a great idea! I think I might make some this weekend! Thank you Kristyn! Love U! Super cute, Des! I love the little snowballs! Thank you so much! I adore you girls! Thank you so much Tanya! These were so much fun to make!